We've all seen Punxsutawney Phil emerge from the soil on Groundhog Day to tell us whether or not we're in for six more weeks of winter...an animal with such a cuddly coat of fur has to be easygoing, right? Believe it or not, groundhogs—also called woodchucks—can be a powerful menace to gardens, despite their lovable appearance. Many homeowners in the United States find themselves struggling with these pests who dig holes all over the yard and target garden plants. In order to learn about what a groundhog eats, it's best to first have a basic understanding of what kind of animal a groundhog actually is. So, What Do Groundhogs Eat? Groundhogs belong to a group of animals known as marmots. These are a group of mammals that gorge themselves during the summer to build up enough fat reserves to hibernate during the winter. Most weigh about 13 lbs. and can live up to six years in the wild. Read Also: What's the best way to get rid of groundhogs? Groundhogs spend most of their time burrowing, caring for their young, and searching for food. They have long claws on their paws which they use to push dirt and create underground tunnels. The babies are born blind and hairless, so the mothers spend some time making sure they adapt to their environments safely. When they're not looking for something to eat, groundhogs typically avoid humans. Groundhogs prefer to live between wooded and clear areas—in particular, they like the edges of forests. Most individuals dig themselves a burrow for a home. This burrow can be six feet deep, twenty feet wide, and have over a dozen entrances. In contrast to most animals, males and females actually don't live together. Instead, come spring, the males will visit females and introduce themselves to find a mate. Watch the video below to see a groundhog emerge from its burrow to investigate a strategically-placed GoPro! Groundhogs earned the name "whistle-pig" because of the high-pitched whistling noise they make, used to alert other groundhogs to danger in the area. If one is in your yard and making this sound, it means it is warning others about something nearby. Groundhogs are herbivores, which means they feast on an entirely plant-based diet. These animals enjoy grasses, dandelions, clovers, and many other weeds and plants. They will also eat agricultural crops and plants like lettuce, carrots, and black and red raspberries. Sometimes they eat grubs and bugs, but not often. Read Also: What's the best groundhog bait? To check out the varied diet of groundhogs, take a look at what Eddie, a groundhog kept by the Cleveland Museum of Natural History, is fed on a daily basis. Because of the variety of their diet, groundhogs can be a big problem for gardeners or people who grow their own vegetables. Groundhogs need to eat a lot to prepare for hibernation, and they do not understand the concept of private property. Groundhogs are versatile and tenacious animals. It's not hard for them to find their way into a garden, especially if they see a tasty treat like bean pods or clover patches. Read Also: How to pick a good groundhog trap? They're not geniuses, however. You can follow a couple of simple steps to avoid these pests. These methods stop groundhogs in different ways. They are skilled climbers but might be deterred by a high fence. Groundhogs don't like people and will avoid an area with a repellent. If there's no food, there's no reason to come in. Additionally, they don't like the taste of red pepper and won't want to eat affected plants. (Keep in mind that you can wash this off later if you want to eat them.) Finally, the reflective nature of the Mylar works as a deterrent because it scares the groundhogs away from your property. In general, groundhogs don't like humans and won't go near them. They will most likely run away and hide in their burrows. They can be repelled by the smell of humans, so sometimes people will leave hair or scented objects like shirts near burrow openings to scare the groundhogs away. Will a Groundhog Bite Your Pet? Groundhogs can bite, but only when they feel threatened. One of these animals biting a dog or cat is pretty rare, but can happen if the groundhog is cornered. This can be dangerous since it's hard to tell whether or not a groundhog has rabies just from looking at it. If a pet is bitten by a groundhog (or any other animal, for that matter), immediately take it to a vet for treatment. 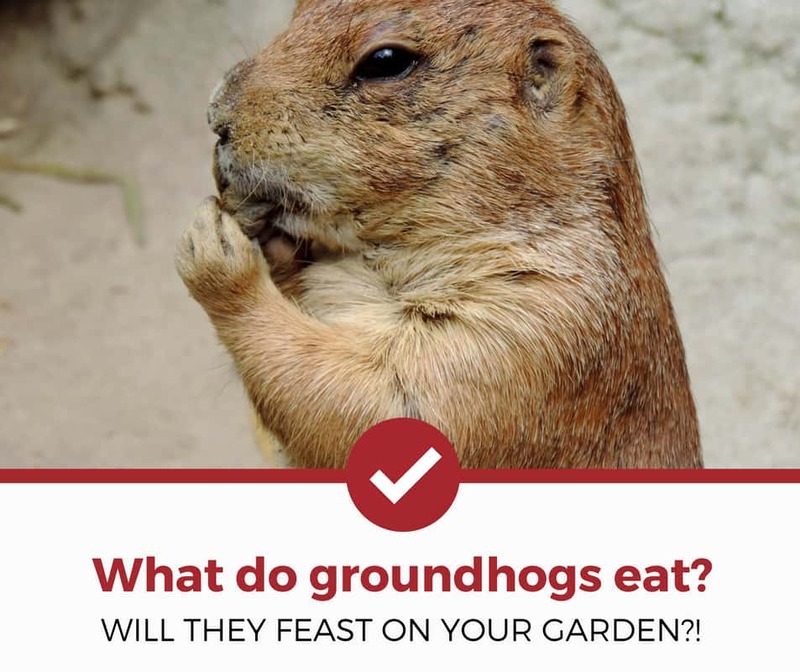 Groundhogs, regardless of their cuddly outward appearance, can be persistent pests that like to chow down on vegetables and garden plants. If you suspect that one is plaguing your yard, it's best to know what they eat and what their habits are. Be sure to follow these tips so that you can prevent them from devouring your garden, and keep your yard fresh and healthy! Curious about other groundhog articles? Check out our other detailed guides to help you deal with your pest problems.